Toho Koki Company: HIT Brand. 02/10/2019: Renumbered figures, added a Truecraft 80131 1 Inch Drive Flex Handle. 01/25/2019: Added a Allenite 15 Inch Flex Handle. 01/25/2016: Added a Fuller (KTC) 5/8 Combination Wrench. 01/24/2016: Added configurations for Truecraft indexable ratchet: Truecraft Flex Handle with Ratchet and Truecraft Flex Handle with Short Arm and Ratchet, added a Fuller (KTC) 3/4 Combination Wrench. 01/11/2016: Added Truecraft K506 Tongue-and-Groove Pliers and a Allenite 1/2-Drive Reversible Ratchet. 12/17/2015: Minor reorg, added a Truecraft 16731 Spline-Drive Flex Handle. 12/16/2015: Added a Truecraft 3/8-Drive Indexable Ratchet Kit. 12/09/2011: Added a Truecraft 204 Adjustable Wrench. 11/19/2011: Added a New Lobster 200mm Adjustable Wrench. 10/30/2011: Added Super Tool Company. 09/01/2011: Added Three Peaks 8 Inch Lineman's Pliers. 05/17/2011: Added a Truecraft A104B Tappet Wrench. 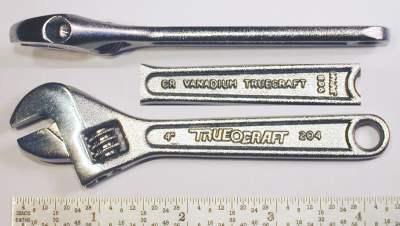 05/14/2011: Added a Truecraft A106B Open-End Wrench. 04/25/2011: Added a Truecraft 30134 3/8-Drive Flex-Head Ratchet. 04/18/2011: Added a Tone Tool 22mmx24mm Offset Box Wrench. 03/27/2011: Added a Award 15/16x1 Open-End Wrench by KTC. 03/26/2011: Added a Allenite 1/2x9/16 Open-End Wrench. 03/19/2011: Added a Super Tool 200mm Adjustable Wrench and a Showa 5/8x3/4 Open-End Wrench. 03/18/2011: Added a Truecraft 40130 1/2-Drive Ratchet. 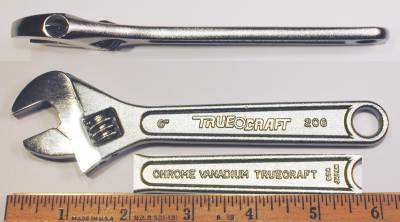 03/16/2011: Added a Truecraft F208 Adjustable Wrench. 03/15/2011: Added a Truecraft B719B Flex-Box Combination Wrench, a Mitoloy 449 1/2-Drive Ratchet, and a Hit "ROI" 150mm Adjustable Wrench. 03/14/2011: Added a Mitoloy 1/2-Drive Flex-Head Handle. 03/12/2011: Added a Asahi 36mmx41mm Offset Box Wrench. 03/11/2011: Added a Tone Tool 24mmx27mm Offset Box Wrench and a Hit 21mmx26mm Offset Box-End Wrench. 03/10/2011: Page created and content moved from other pages, added a Top 36mmx41mm S-Shaped Box Wrench. 03/09/2011: Added a Truecraft 30130 3/8-Drive Fine-Tooth Ratchet and a Truecraft 206 Adjustable Wrench. 06/26/2009: Added Truecraft (Three Peaks) K-358-G Lineman's Pliers. 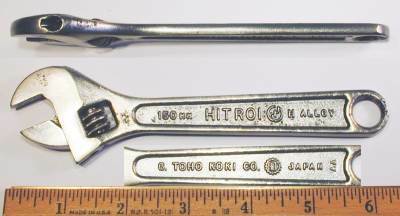 06/21/2009: Added Toho Koki Company (HIT Brand), added a "Strong HIT" 200mm Adjustable Wrench. The company's website (in Japanese with a few subtitles) is at Asahi Tool [External Link]. Fig. 1. Asahi 36mmx41mm Offset Box-End Wrench, with Inset for Side View and Reverse Detail. Fig. 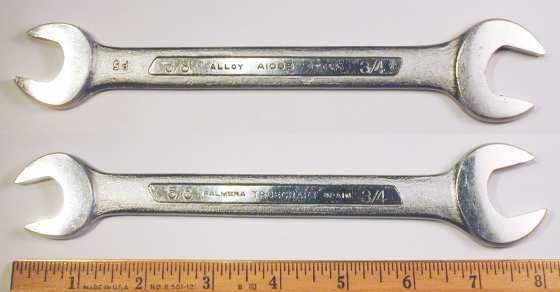 1 shows an Asahi 36mmx41mm offset box-end wrench, marked with "Asahi Tools" and an "ASH" logo forged into the front, with "Chrome-Vanadium" and a "40-77" code forged into the reverse. The metric sizes are stamped with "41" on the front and "36" on the back. The overall length is 18.4 inches, and the finish is chrome plating. The Daido Corporation is a Japanese import and export trading company with products including automotive and motorcycle parts, power transmission chains, conveyor chains, motion control products, and power and hand tools. In 1951 Daido established a subsidiary in the United States and by 1954 was offering hand tools under the "Allenite" brand. Daido later acquired the Truecraft Tool Company and began using the "Truecraft" brand for its hand tools. (We haven't yet found the exact date of the acquisition, but it was sometime after 1959.) Daido's Truecraft Tool division offered high quality medium-priced tools from the early 1960s until about 2000, when the division was closed. Most of the production was done in Japan, but the company also did some manufacturing in the United States and in Palmera, Spain. Keep in mind that as an export trading company, Daido could be sourcing tools from a number of other Japanese tools companies, as well as its own production facilities. As we learn more about the various Japanese tool makers, we hope to be able to determine which companies produced tools for the Daido brands. Daido's website (in English) is available at Daido Kogyo [External Link]. The US subsidiary is now called Advantech International and has a website at www.advantechinternational.com [External Link]. We have a substantial selection of Truecraft tools available, including wrenches, pliers, and socket tools up to the 1 inch drive size, and this section will be expanded as time permits. Fig. 2. Truecraft 204 4 Inch Adjustable Wrench, with Insets for Side View and Reverse Detail. Fig. 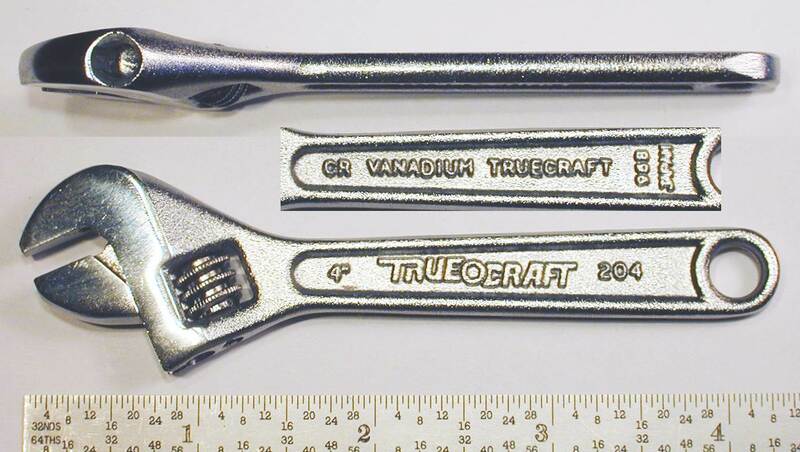 2 shows a Truecraft 204 4 inch adjustable wrench, marked with "Truecraft" and the model number forged into the shank, with "Cr Vanadium Truecraft" and "Japan" forged into the reverse. The overall length is 4.3 inches, and the maximum opening is 0.5 inches. The head thickness was measured at 0.35 inches. Fig. 3. Truecraft 206 6 Inch Adjustable Wrench, with Insets for Side View and Reverse Detail. Fig. 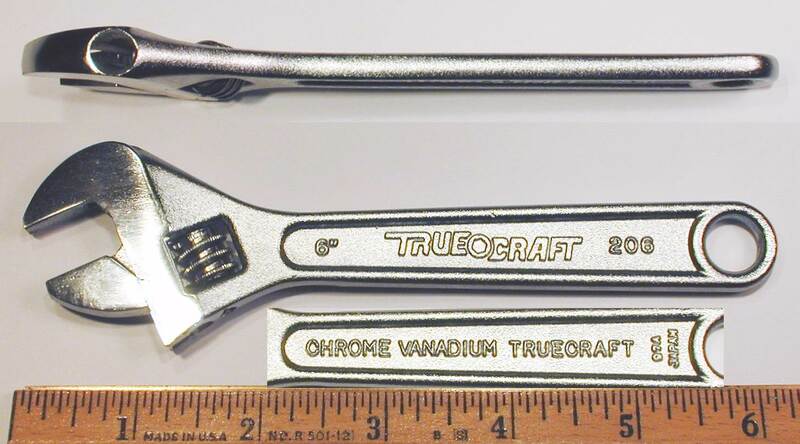 3 shows a Truecraft 206 6 inch adjustable wrench, marked with "Truecraft" and the model number forged into the shank, with "Chrome Vanadium Truecraft" and "Japan" forged into the reverse. The overall length is 6.2 inches, and the maximum opening is 0.8 inches. The head thickness was measured at 0.40 inches. Fig. 4. Truecraft F208 8 Inch Adjustable Wrench, with Insets for Side View and Reverse Detail. Fig. 4 shows a Truecraft F208 8 inch adjustable wrench, marked with "Drop Forged Tool Steel" and "Top" forged into the shank, with "Truecraft Tool" and "Japan" forged into the reverse. The reverse is also stamped with the "F208" model number on a small raised panel. The overall length is 7.9 inches, and the maximum opening is 0.9 inches. The head thickness was measured at 0.47 inches. The "Top" marking is believed to indicate production by the Top Kogyo Company. Fig. 5. 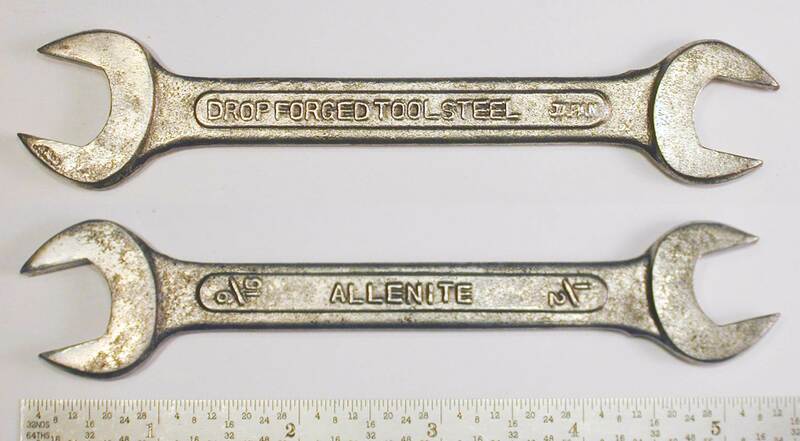 Allenite 1/2x9/16 Open-End Wrench, with Inset for Reverse, ca. 1954 to Early 1960s. Fig. 5 shows an Allenite 1/2x9/16 open-end wrench with raised panels, marked with "Allenite" and the fractional sizes forged into the shank, with "Drop Forged Tool Steel" and "Japan" forged into the reverse. The overall length is 5.2 inches, and the finish is plain steel, with traces of chrome plating. The next two figures show examples of Truecraft tools sourced from Palmera, Spain. Fig. 6. Truecraft A106B 5/8x3/4 Open-End Wrench, with Inset for Reverse. Fig. 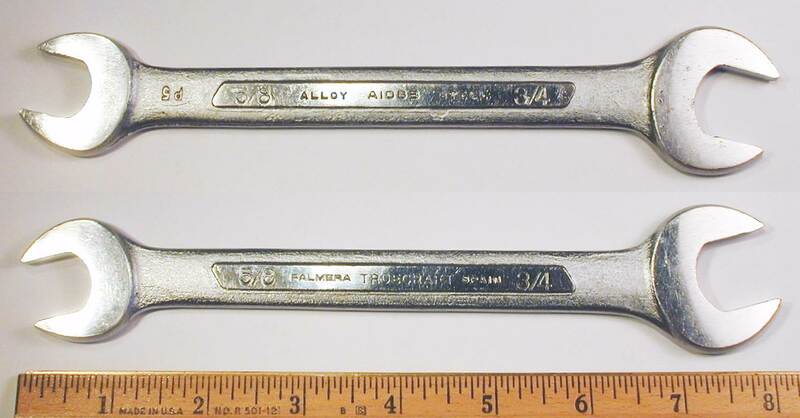 6 shows a Truecraft A106B 5/8x/34 open-end wrench with raised panels, stamped with "Truecraft" and "Palmera Spain" on the front panel, with "Alloy Steel" and the model number on the reverse. Both sides are also stamped with the fractional sizes. Fig. 7. Truecraft A104B 9/16x5/8 Tappet Wrench, with Inset for Reverse. Fig. 7 shows a Truecraft A104B 9/16x5/8 tappet wrench with depressed panels, marked with "Truecraft" and "Palmera Spain" forged into the front panel, with "Chrome Vanadium" and the model number forged into the reverse. Both sides also have the fractional sizes forged into the shank. The overall length is 7.4 inches, and the finish is chrome plating with polished faces. Fig. 8. Truecraft B719B 19mm Flex-Box Combination Wrench, with Insets for Side View and Reverse Detail. Fig. 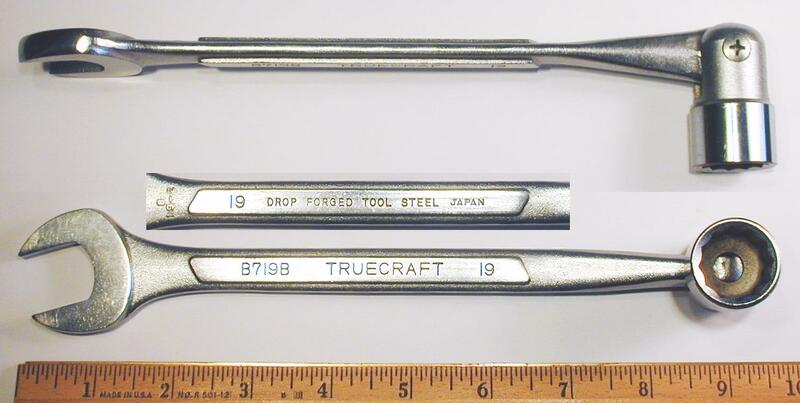 8 shows a Truecraft B719B 19mm flex-box combination wrench with a panelled shank, stamped with "Truecraft" and the metric size on the front panel, with "Drop Forged Tool Steel" and "Japan" on the reverse panel. The reverse shank also has a forged-in code "B 19-2" visible at the left. The overall length is 10.3 inches fully extended, and the finish is chrome plating with polished faces. Fig. 9. Truecraft K506 6 Inch Tongue-and-Groove Pliers, with Insets for Side View and Marking Detail. Fig. 9 shows a pair of Truecraft K506 6 inch tongue-and-groove pliers, stamped with "Truecraft" and the model number on the upper handle, with "Forged" and "Top Japan 71A" on the botton handle. The overall length is 7.1 inches fully extended, and the finish is chrome plating with polished faces. The "Top" marking is believed to indicate production by the Top Kogyo Company, and a check of their web site found similar pliers were made in the past, although now discontinued. 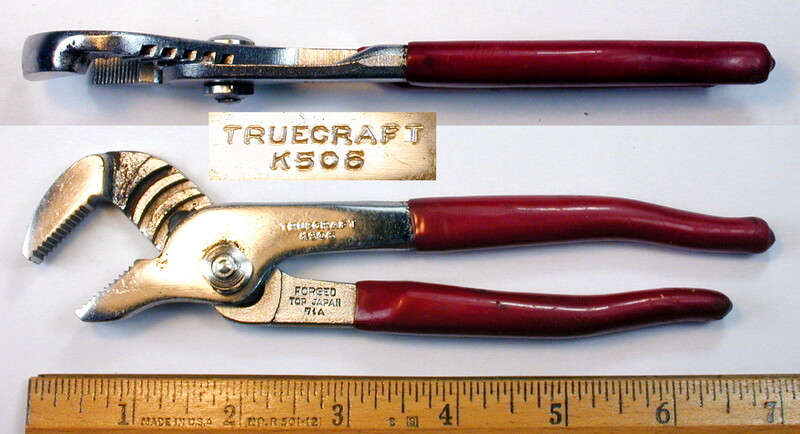 This next figure shows an example of pliers made for the Truecraft brand by the Three Peaks Giken Company. Fig. 10. Truecraft K-358-G 8 Inch Lineman's Pliers, with Insets for Side View and Construction Detail. Fig. 10 shows a pair of Truecraft K-358-G 8 inch lineman's pliers, stamped "Truecraft" with the model number on one side, with "Japan" and the 3-Peaks logo on the reverse. The next two figures show examples of Daido's early production under the Allenite brand. Fig. 11. Allenite 1/2-Drive 10 Inch Reversible Ratchet, with Insets for Reverse and Side View, ca. 1954 to Early 1960s. Fig. 11 shows an Allenite 1/2-drive 10 inch reversible ratchet, stamped with "Japan" on the front cover plate, with "Allenite" on the reverse. The overall length is 10.1 inches, and the finish is chrome plating. The ratchet mechanism uses a 24-tooth gear with dual pawls, giving it a soft action with little backdrag. 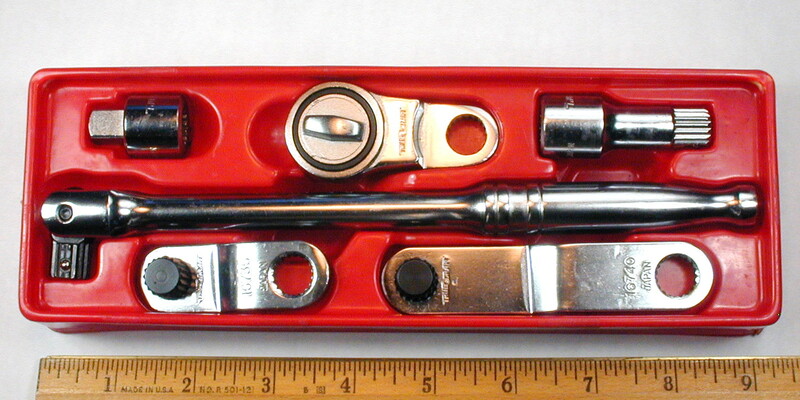 This ratchet is quite similar to the Penens 1661 Ratchet, which may have served as the design model for this tool. Fig. 12. Allenite [G372B] 1/2-Drive 15 Inch Flex Handle, with Insets for Marking Detail, ca. 1954 to Early 1960s. Fig. 12 shows an Allenite [G372B] 1/2-drive 15 inch flex-head handle with a rubber grip, stamped with "Allenite Japan" on the shank. The overall length is 14.7 inches, and the finish is chrome plating. The rubber cushion grip on this tool was a novel feature for the 1950s. This flex handle was still available in a 1973 Truecraft catalog, where it was listed as a model G372B with a rubber grip. Fig. 13. Truecraft 30130 3/8-Drive Fine-Tooth Ratchet, with Insets for Reverse and Side View. Fig. 13 shows a Truecraft 30130 3/8-drive fine-tooth ratchet, stamped with "Truecraft" and the model number on the front, with "Chrome Vanadium" and "Japan" on the reverse. The ratchet mechanism uses a 42-tooth gear with a single-action pawl. The mechanism is held in place by a flat coil spring and can be removed for cleaning or replacement. Fig. 14. Truecraft 30134 3/8-Drive Flex-Head Ratchet, with Insets for Reverse and Side View. Fig. 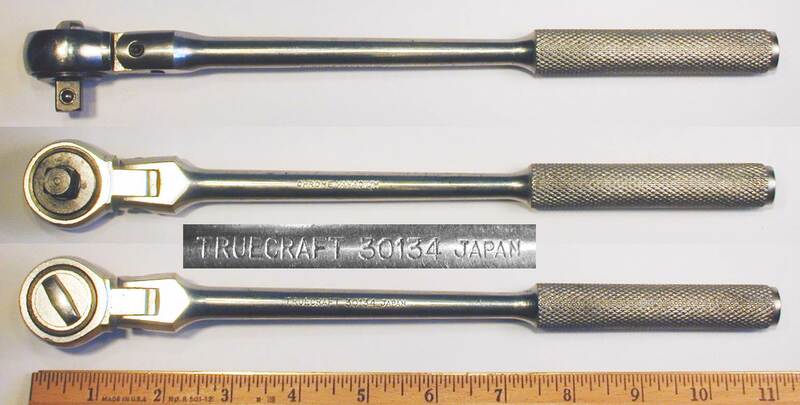 14 shows a Truecraft 30134 3/8-drive flex-head ratchet, stamped with "Truecraft" and the model number on the front, with "Chrome Vanadium" and "Japan" on the reverse. The flex head is held in place by a friction ball and has five indexed positions. Fig. 15. Truecraft 40130 1/2-Drive Fine-Tooth Ratchet, with Insets for Reverse and Side View. Fig. 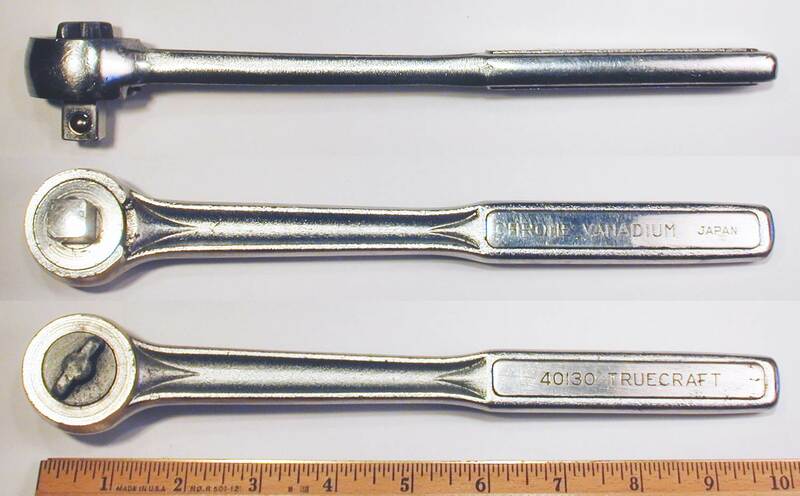 15 shows a Truecraft 40130 1/2-drive fine-tooth ratchet, stamped with "Truecraft" and the model number on the front, with "Chrome Vanadium" and "Japan" on the reverse. The ratchet mechanism uses a 44-tooth gear with a single-action pawl. The mechanism is held in place by a spring clip and can be removed for cleaning or replacement. Some of our readers may be familiar with the idea of an indexable ratchet, which usually just means a ratchet with a head that can be offset at various angles. Typically they're used to work around overhead obstructions that prevent access by ordinary ratchets and extensions. It's the kind of tool that you probably won't need very often, but when you need it, you need it badly. This next tool takes the concept of "indexable ratchet" to a whole new level though: a six-piece ratchet kit with parts held together by spline drives, allowing the creation of a myriad of special-purpose ratchet-and-handle configurations. Fig. 16. Truecraft 3/8-Drive 6-Piece Indexable Ratchet Kit. Fig. 16 shows a Truecraft 3/8-drive 6-piece indexable ratchet kit, consisting of a 16730 3/8 drive fine-tooth ratchet head, a 16731 spline-drive flex-head handle, a 16736 spline-drive short offset arm, a 16740 spline-drive long offset arm, a 16750 spline-to-spline 2 inch extension, and a 16780 spline to 3/8-drive adapter. Each piece is stamped with "Truecraft" and "Japan" plus the model number. The kit is supplied in a plastic organizer measuring 9.0 inches long and 3.1 inches wide. The tools are finished in chrome plating. We'll add some more photos showing some of the possible configurations later. Fig. 17. Truecraft 16731 Spline-Drive Flex Handle, with Inset for Reverse. Fig. 17 shows the Truecraft 16731 spline-drive flex handle from the indexable ratchet kit, stamped with "Truecraft" and the model number on the shank, with "Chrome Vanadium" and "Japan" on the reverse. The reverse also has a "Pat. Pend" notation. The overall length is 9.0 inches, and the finish is polished chrome. The spline drive has 18 teeth, providing rotational increments of 20 degrees for the tool configurations. The next figures show some of the many possible configurations of the indexable ratchet kit. Fig. 18. 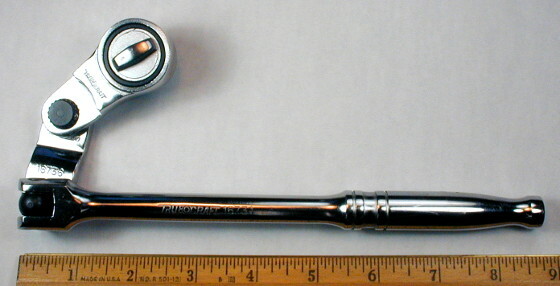 Truecraft Flex Handle with Ratchet Head. Fig. 18 shows one of the configurations of the Truecraft indexable ratchet kit, the 16731 flex handle connected to the 16730 ratchet head. Fig. 19. Truecraft Flex Handle with Short Arm and Ratchet Head. Fig. 19 shows another possible configuration of the Truecraft indexable ratchet kit, with the 16731 flex handle connected to the 16736 short offset arm, and the 16730 ratchet head connected to the offset arm. The two splines provide 324 configurations, although some positions are blocked by the vertical offset of the arm. In addition, both the arm and the ratchet can be flipped over, giving up to 1,296 configurations. But don't worry, we're not planning to show photographs of all possible configurations! Fig. 20A. Truecraft 80131 1 Inch Drive Flex Handle, with Insets for Marking Detail. Fig. 20A shows a Truecraft 80131 1 inch drive flex handle with its tubular extension removed. The extension is stamped with "Truecraft" and the model number on one side, with "Japan" and "995" on the reverse, as seen in the insets. The flex handle is designed as a two-piece unit with a flex head stub handle and a tubular extension, secured by a locking pin. The lengths of the stub handle and extension are 12.7 inches and 14.2 inches respectively, with an overall length of 23.3 inches when assembled. The finish is chrome plating. Fig. 20B. Truecraft 80131 1 Inch Drive Flex Handle in Extended Position. Fig. 20B shows the Truecraft 80131 1 inch drive flex handle with the tubular extension installed. The overall length is 23.3 inches, and the finish is chrome plating. The Kyoto Tool Company is a well-known toolmaker offering high quality tools for professional use under the Nepros and KTC brands. The company also provides extensive contract manufacturing services for a number of customers, and KTC-made tools can be found under many other brands. The company's website (in English) is available at KTC Kyoto Tool[External Link]. The website includes an interesting Brand History[External Link] section which describes its roots from the 1930s, when it produced tools to maintain the famous "Zero" fighter planes. Fig. 21. Award 15/16x1 Open-End Wrench, with Inset for Reverse and Marking Detail. Fig. 21 shows an Award 15/16x1 open-end wrench with depressed oval panels, marked with "Chrome Vanadium" and the fractional sizes forged into the shank, with "Drop Forged" and "Japan" plus the KTC-Circle logo forged into the reverse. The overall length is 11.9 inches, and the finish is chrome plating. Currently we're not familiar with the Award brand, but the KTC-Circle logo indicates that the wrench was produced by the Kyoto Tool Company. The next two figures show examples of KTC's production for Fuller Tool, a company founded in Whitestone, New York in the late 1930s but now based in Montreal, Canada. Fig. 22. Fuller 5/8 Combination Wrench, with Insets for Side View and Reverse Detail, ca. 1970s to 1980s. Fig. 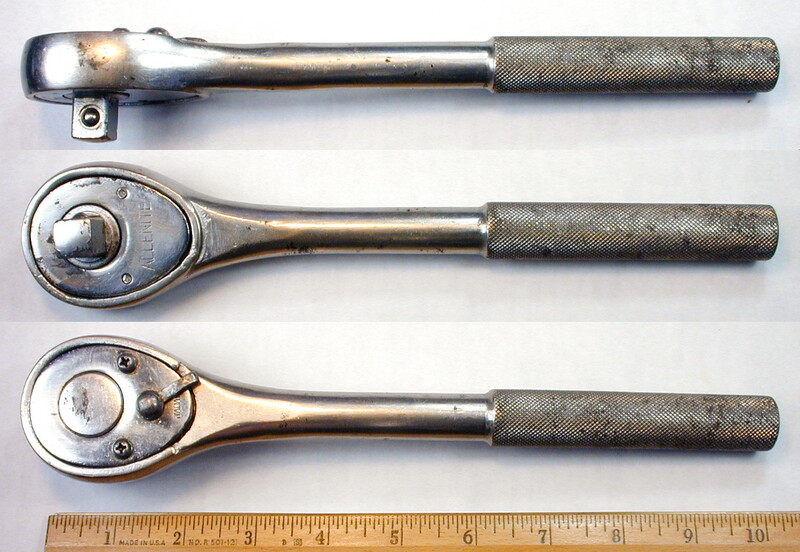 22 shows a Fuller 5/8 combination wrench with raised panels, stamped with "Fuller" and the fractional size on the front panel, with "Forged Alloy" and "Japan" plus the KTC-Circle logo on the reverse panel. The reverse shank also has a forged-in "F6" code visible at the left. The overall length is 7.0 inches, and the finish is chrome plating with polished faces and ends. The Fuller brand is sold through hardware stores and other retail stores. KTC's production for Fuller probably goes back to the 1970s or 1980s, and based on KTC's reputation we would expect these to be high quality tools. Fig. 23. Fuller 3/4 Combination Wrench, with Insets for Side View and Reverse Detail, ca. 1970s to 1980s. Fig. 23 shows a Fuller 3/4 combination wrench with raised panels, stamped with "Fuller" and the fractional size on the front panel, with "Chrome Molybdenum" and "Japan" plus the KTC-Circle logo on the reverse panel. The reverse shank also has a forged-in "U4" code visible at the left. The overall length is 9.5 inches, and the finish is chrome plating with polished faces and ends. The Lobtex Company (formerly the Lobster Tool Company) was founded in 1888, making it one of the oldest tool companies in Japan. The company's earliest products were hair clippers, and by 1928 the company had begun production of wrenches and pliers. The company's website (in English) is at www.lobtex.co.jp [External Link], and an outline of the company's history can be found on the Company History [External Link] page. Fig. 24. New Lobster 200mm Adjustable Wrench, with Insets for Side View and Reverse Detail. Fig. 24 shows a New Lobster 200mm (8 inch) adjustable wrench, marked with "New Lobster" and "Made in Japan" plus the company's "Lobster" symbol forged into the shank, with "Forged Alloy Steel" and the JIS logo forged into the reverse. The overall length is 8.1 inches, and the maximum opening is 1.0 inches. The head thickness was measured at 0.47 inches. The company's website (in English) is at Tone Tool [External Link]. Fig. 25. Tone Tool 22mmx24mm Offset Box-End Wrench, with Insets for Side View and Reverse Detail. The overall length is 13.1 inches, and the finish is chrome plating. Fig. 26. Tone Tool 24mmx27mm Offset Box-End Wrench, with Insets for Side View and Reverse Detail. The overall length is 14.1 inches, and the finish is chrome plating. The company's website (mostly in Japanese) is available at www.mitotool.com [External Link]. Fig. 27. 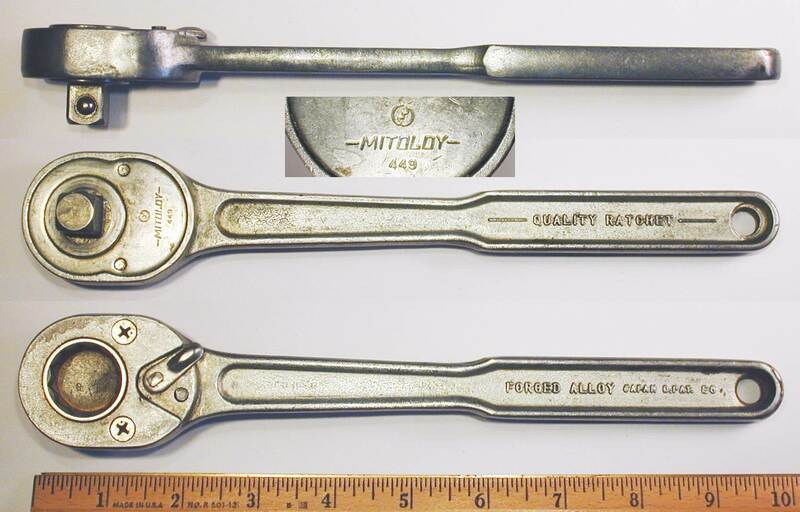 Mitoloy 449 1/2-Drive Ratchet, with Insets for Reverse, Side View, and Marking Detail. Fig. 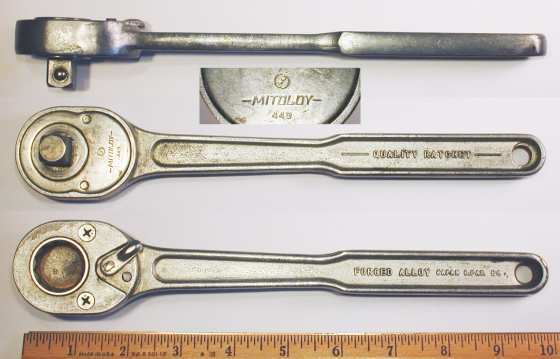 27 shows a Mitoloy 449 1/2-drive ratchet, stamped with "Mitoloy" and the model number plus the JIS logo on the cover plate (see lower inset). The deeply panelled shank is marked with "Forged Alloy" and "Japan" forged into the front, with "Quality Ratchet" forged into the reverse. The overall length is 9.9 inches, and the finish is plain steel with traces of an iridescent metal coating. One unusual feature of the ratchet is the 20mm double-hex opening on the top side, suggesting that this tool was designed for a special application. The ratchet mechanism uses a 20-tooth drive gear, with dual pawls alternately disabled by a cam connected to the shift lever. Fig. 28. Mitoloy 1/2-Drive Flex Handle, with Insets for Construction and Marking Detail. Fig. 28 shows a Mitoloy 1/2-drive flex-head handle, stamped "Mitoloy" and "Japan" with the JIS logo on the shank. The overall length is 11.9 inches. The finish is plain steel, possibly with traces of cadmium plating. The handle piece is made of tubular steel with a knurled gripping surface. The hollow handle would reduce the weight for normal service, and would also allow the use of an extender bar for extra leverage if needed. The handle also has a drilled cross-bar hole to allow use as a Tee-handle. The construction of the tool reveals a design for a strong but light tool of minimal cost. The tool consists of three simple parts -- a forked flex head, a bar shank, and a tubular handle -- all held together with two spring roll pins. The Super Tool Company is a Japanese manufacturer of general hand tools, plumbing tools, and factory maintenance equipment, with operations in Sakai City, Osaka prefecture, Japan. Further information can be found on the company's Japanese website at Supertool [External Link], or at Supertool (English) [External Link]. Fig. 29. Super Tool 200mm (8 Inch) Adjustable Wrench, with Insets for Side View and Reverse Detail. Fig. 29 shows a Super Tool 200mm (8 inch) adjustable wrench, marked with "Vanadium Steel" and a "Super" diamond logo forged into the shank, with "Drop Forged" and "Japan" plus the JIS logo forged into the reverse. The reverse shank also has a forged-in code "H 1-02 1447" to the right of the JIS logo. The overall length is 8.2 inches, and the maximum opening is 1.0 inches. The maximum head thickness was measured at 0.53 inches. Some design and construction differences were noted for this wrench, when compared with examples from other Japanese makers. In particular, note that the gullet is square rather than hexagonal, allowing a closer grip on square nuts. Another difference is that the adjusting knurl is secured with a press-fit pin rather than a threaded rod. The hole for the pin is drilled through to the top, allowing the pin to be removed with a drift punch in the event replacement is necessary. The Three Peaks Giken Company is a Japanese manufacturer specializing in nippers and pliers, with operations in Sanjo City, Niigata prefecture, Japan. Further information can be found on the company's website (mostly in Japanese) at Three Peaks Giken Company [External Link]. 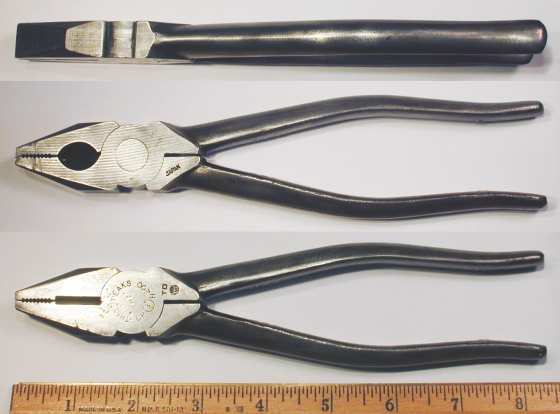 This next figure shows an example of pliers made by Three Peaks as contract production for the Truecraft brand, a brand owned by the Daido Corporation. Fig. 30. Truecraft K-358-G 8 Inch Lineman's Pliers, with Insets for Side View and Construction Detail. Fig. 30 shows a pair of Truecraft K-358-G 8 inch lineman's pliers, stamped "Truecraft" with the model number on one side, with "Japan" and the 3-Peaks logo on the reverse. The lower inset shows a close-up of the "3-Peaks" logo, a design showing three mountain peaks within a circle. We were unfamiliar with this meaning of this logo, but one of our readers from Japan kindly sent an explanation with a link to the company's website. The logo design is used by the Three Peaks Giken Company[external link], a Japanese tool maker specializing in nippers and pliers. In addition to offering contract production, Three Peaks also provides tools under their own name, as the next figure illustrates. Fig. 31. Three Peaks 200 8 Inch Lineman's Pliers, with Insets for Reverse and Side View. Fig. 31 shows a pair of Three Peaks 200 8 inch lineman's pliers, stamped with "Three Peaks Cp" and the JIS logo around the pivot. The face is also stamped with "TD" and the 3-Peaks logo, with "Japan" on the reverse. The Toho Koki Company is a Japanese toolmaker best known for its "HIT" brand tools, including Crescent-style adjustable wrenches, pipe wrenches, and bolt cutters. The company was founded in 1938 and is located in Yamatokoriyama, Nara prefecture, Japan. Toho Koki has several trademarks registered in Japan, including "HIT", "Strong HIT", and a logo with "HIT" in the center of a gear, referred to as the HIT-Gear logo on this site. The company maintains a website in Japanese and English at www.hittools.co.jp [External Link], and information on the company's History [External Link] and products can be found there. Fig. 32. Hit 21mmx26mm Offset Box-End Wrench, with Insets for Side View and Reverse Detail. The overall length is 14.3 inches, and the finish is chrome plating. Fig. 33. Hit "ROI" 150mm (6 Inch) Adjustable Wrench, with Insets for Side View and Reverse Detail. Fig. 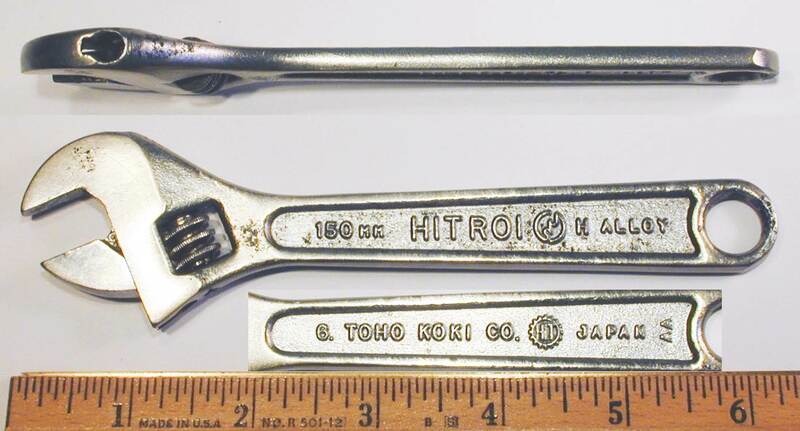 33 shows a Hit "ROI" 150mm (6 inch) adjustable wrench, marked with "HIT ROI" and "H Alloy" plus the JIS logo forged into the shank, with "Toho Koki Co." and "Japan" plus the HIT-Gear logo forged into the reverse. Fig. 34. "Strong HIT" 200mm (8 Inch) Adjustable Wrench, with Insets for Side View and Reverse Detail. Fig. 34 shows a "Strong HIT" 200mm (8 inch) adjustable wrench, marked with "Strong HIT" and the JIS logo forged into the shank, with "Cr-Mo Drop Forged" and "Japan" plus the HIT-Gear logo forged into the reverse. The shank also has a forged-in code "H 657" to the right of the JIS logo. The overall length is 8.2 inches, and the finish is chrome plating, with some losses due to rust. The company's website (in Japanese) is at Top Kogyo Company, Ltd. [External Link]. Although the website has only a few English subtitles, there are lots of pictures and it's easy to browse through their tool selection. Fig. 35. 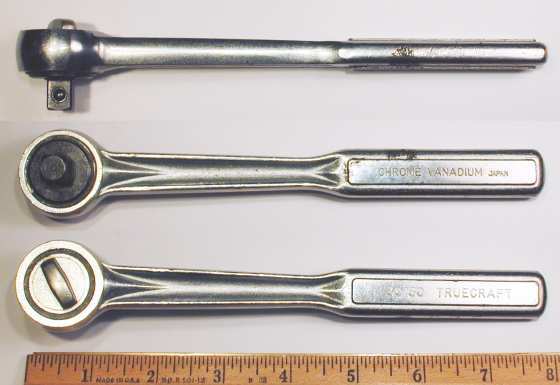 Top 36mmx41mm Specialty Box-End Wrench, with Inset for Reverse. Fig. 35 shows a Top 36mmx41mm specialty box-end wrench with laterally offset openings, somewhat similar to an S-shaped wrench. 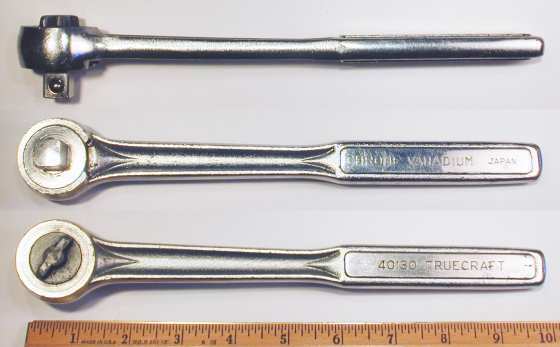 The wrench is marked with "Top" and the metric sizes forged into the front, with "Chrome Vanadium" and the sizes forged into the reverse. The overall length is 18.3 inches, and the finish is chrome plating. This section will show examples of tools from other Japanese brands for which the manufacturer is not yet known. Fig. 36. 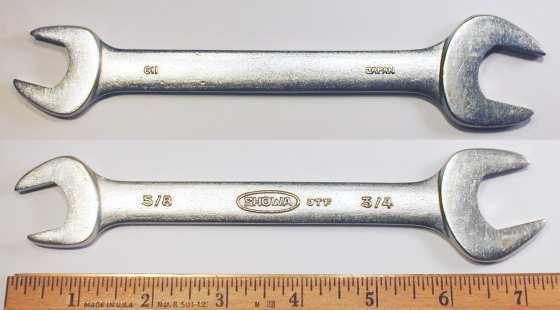 Showa 5/8x3/4 Open-End Wrench, with Inset for Reverse. Fig. 36 shows a Showa 5/8x3/4 open-end wrench, marked with "Showa" in an oval logo and "JTF" forged into the shank, with "119" and "Japan" forged into the reverse. The overall length is 7.2 inches, and the finish is chrome plating.